HDFC ERGO General Insurance Company, India's third largest non-life insurance provider in the private sector and Utkarsh Small Finance Bank on 27 June signed a corporate agency agreement for the distribution of general insurance products through the bank's network of branches across the country. 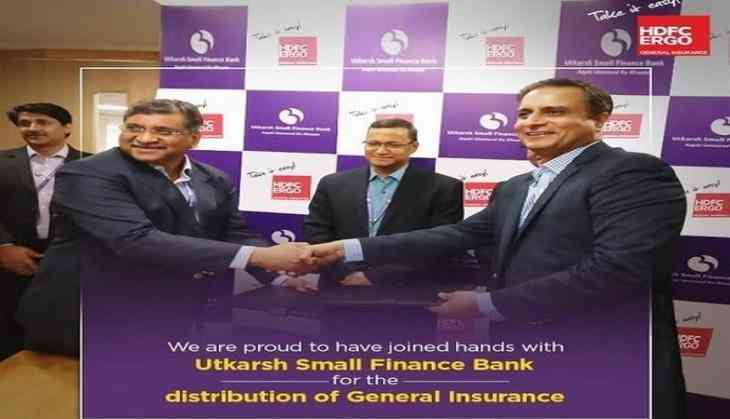 The association with Utkarsh Small Finance Bank will offer general insurance products from HDFC ERGO to the bank's clients across India. A plethora of general insurance products such as motor insurance, home insurance, health insurance, travel insurance and fire insurance will be offered through the bank's network of branches. "Partnering with Utkarsh Small Finance Bank is an important milestone for us as part of our growth strategy. It is our endeavor to expand our horizon and make our products more widely available to the consumers at various touch points across the country. We see immense opportunity in this partnership and firmly believe that the customers of the Bank will benefit from the bouquet of our products which will now be available through the Bank's network," said Anuj Tyagi, Executive Director, HDFC ERGO General Insurance Company. "When it comes to financial services, we want to offer our clients a bouquet of Financial Services under one roof and the partnership with HDFC ERGO is a strategic step in that direction. Our customers will now be able to gain access to various general insurance products. This association is in line with our proposition of delivering best and offering services that add value to our clients," added Govind Singh, MD and CEO, Utkarsh Small Finance Bank Ltd. The partnership aims to provide enhanced customer experience by leveraging technology to augment the comprehensive range of third party products and services distributed by the bank.